This is my body, mind, and spirit journey using the best smelling essential oils that I crave sharing them with you. I’m addicted to the aromas and I’m sure you will be too. You might be thinking, What are some of the best smelling oils to diffuse? You might enjoy reading about the Top 10 Best Essential Oil Brands: Uses and Benefits that is even more detailed with useful information. We know that the ancient civilizations of Egypt, Greece, and Rome, used plant oils for their baths and perfume. So as always, nothing is new under the sun. Yep, the best essential oil brands offer the best fragrances for essential oils. The first small collection that I love on Amazon.com® is a set that has some heady fragrances that I really enjoy. This array is inexpensive and you will love the aroma of each one. 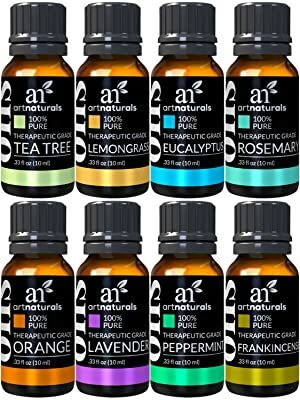 The ArtNaturals® 100% pure therapeutic grade of 8 each 10 mL (0.34-ounces) essential oils are fragrant, have healing benefits, and are steam-pressed. They are perfect for aromatherapy in a diffuser and as a body massage using a carrier oil. Each is perfect for diffusing and ideal for skin care using a carrier oil such as Jojoba. Essential oils are derived from nature, not from fake chemicals made in a laboratory then packed in spray cans and plug-ins that are not good for sensitive people. The fake ones have me sneezing immediately and the fragrance doesn’t smell like what its name says. These 100% pure essential oils are safe used in nebulizer diffusers, some vaporizers or humidifiers with an essential oil tray made specifically for them. I have stopped using candles to have the true plant aroma and I reap the benefits when inhaling the mist as well with essential oils. ArtNaturals® uses no parabens or animals to test their products on. This set of essential oils targets stress, fatigue, low self-esteem, anxiety, mental vagueness, muscle aches and pains, plus each one smells magnificent. Diffuser: Add 5-7 drops of the 100% pure essential oils of your choice to a diffuser. The URPOWER is an excellent ultrasonic diffuser at an affordable choice. Sugar Scrub: 1/2-cup white or brown sugar, 1/2-cup Coconut or Jojoba Oil, 5-7 drops of an oil or oil blend of your choice. Rub into your skin, rinse, and towel dry. Linens and Clothes Spray: Add 5-7 drops of one of the oils of your choice to a 4-ounce spray bottle of water. Shelf Life: When stored in a dark cool environment, all 8 oils will have a shelf life of approximately 2-years after opening. You can store them in an organized storage box as well to keep them in the right environment. Safety Information: These are used for topical and aromatic use only. Always test for skin sensitivity before using. Older oxidized essential oils can increase the potential for skin irritation. Do not ingest orally and keep out of eyes, ears, and nose. Excessive use of any essential oil can lead to sensitization. These products are not intended to diagnose, treat, cure, or prevent any disease. You might like to know, as I do, the following information and what part of the plant is used. Aromatherapy has miraculous effects on our health, mind, and spirit energy. The benefits of aromatherapy can be obtained with the essential oils that are derived from nature’s plants—flowers, leaves, fruit, bark, roots, seeds, resin, rinds or skin, grass, and stems. So, enjoy all the best smelling essential oils from all parts of nature’s plants and trees. Frankincense essential oil calms, fights fatigue, and increases circulation. Used with a carrier oil, it helps heal eczema, psoriasis, and dandruff, with its lovely scent. Lavender essential oil’s delightful fragrance reduces stress and creates a warm and welcoming environment. Used with a carrier oil, it helps heal minor burns, cuts, insect bites and bee stings, eczema, dandruff, dry skin, and soothes anxiety. Eucalyptus essential oil used in a diffuser or humidifier, assists the weary cold and flu sufferer, and a few drops in shampoo or conditioner revs up your scalp and fights dandruff. Lemongrass essential oil fights bacteria and other microbes, deodorizes, deters insects, and its fragrance lifts spirits and soothes anxiety and depression. Peppermint essential oil used as directed, can calm indigestion, relieve sinus congestion and headaches, and boost energy levels. Its anti-inflammatory properties make it excellent for use with a carrier oil to massage tired, achy muscles. I grow peppermint with the flowers because they are pretty and make tea from the leaves. They grow in my herb garden and the bees and butterflies love them! Sweet Orange essential oil has a wonderfully uplifting scent, used in a diffuser or humidifier. Used with a carrier oil and as directed, it perks up dull skin and is healing for mouth and gums. Tea Tree essential oil is in a class by itself when it comes to fighting infection, fungus, and acne and blends well to become a remarkable beauty product as well. Rosemary essential oil is invigorating, refreshing, and stimulating. Used with a carrier oil for massage, it helps to relieve arthritis pain. Its antiseptic properties make it a natural healer, and it is believed to help improve memory. These are also the best smelling essential oils for body massages too. Jasmine Essential Oil (Jasminum grandiflorum) is also commonly known as Queen of the Night, Spanish Jasmine, and Royal Jasmine. Jasmine essential oil has a strong rich, floral, and tea-like aroma presenting a middle fragrance note. It is used in aromatherapy as an antidepressant and relaxant. Jasmin is a Persian word, yasmin, and it means gift from God. This is a rather pricey essential oil, but for me, it’s worth it and lasts a long time. I like the Rocky Mountain Oil® brand that comes from India and is in an amber glass 5 mL bottle with orifice hole for dispensing one drop at a time with no waste. It is solvent extracted from the flowers and the aroma is heavenly with a rich, warm floral scent so important in perfumery and diffusion. It blends well with other floral oils such as Radha Rosehip essential oil, and is particularly helpful in preparations for dry, irritated, or sensitive skin. This oil is 100% pure and natural, cold-pressed from the seeds from Chile and certified organic. Rosehip nourishes your skin with its rich source of antioxidants and essential fatty acids. Keep your skin from becoming dry from the summer heat and dry room air from the furnace running in the winter. Keep from having age-related skin damage now before you’re older removing those fine lines and wrinkles. I cannot leave you without talking about the most popular and best smelling essential oil, Lavender (Lavandula angustifolia) by Plant Therapy® that is Kid Safe® too when diluted. This company makes the best smelling essential oils in the marketplace. Popular around the world, fragrant lavender is fast becoming one of the most important botanicals with a wide range of medicinal uses. This grows in the wilds and is also known as English Lavender. This species, L. angustifloria, is camphor-free while other species are not. As an herbal medicine, the flowers are used in an age-old remedy improving mood and relaxing muscles, not to mention the beautifully scented restful sleep, relieving depression and anxiety or for nervous disorders related to a nervous or tense state, including stomach upsets. The remedy is best for diffusion and body massages. If you grow Lavender, the flowers can be used in sweet dishes containing cream, such as ice cream. It can be added to shortbread and icings and used in jams and jellies. Every household must have Lavender! Put a few drops on your logs in the fireplace for an uplifting experience in the winter time. This essential oil is for external use only. Discontinue use if irritation occurs. Keep out of reach of children and pets. I hope you enjoyed reading and hopefully using what I consider the best smelling essential oils today. Remember, they can be the best smelling essential oils for diffusers that you will ever need to buy. Let me have your thoughts, comments, ideas and questions and I will reply to each one of you. Happy shopping!